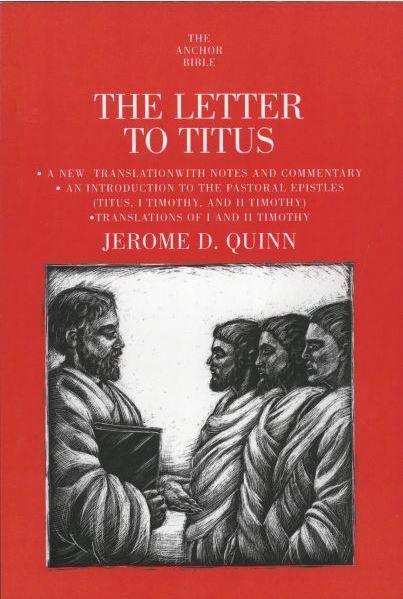 The Letter to Titus, one of the three "Pastoral Epistles" of the New Testament, has over the last twenty years become the ground of intense controversy-theologically, sociologically, even politically. For this letter (like its companions, I and II Timothy) dates to a time when the Apostles are gone and a new church leadership is evolving. In Titus we read instruction that is of continuing importance to the Christian faithful, touching on issues that are with us yet--leadership in the Church and qualifications for authority; propriety of worship; the roles of women; the demands of the Christian ethic upon individuals; the relationship of the new followers of Christ with their Jewish contemporaries. Monsignor Quinn guides us ably through the shoals of contemporary controversy among scholars, dealing definitively with issues of authorship, place of origin, original audience, and the purpose of the Pastorals. More than this, he sets before us his integrated vision of these letters as the earliest anthology on the subject of pastoral leadership. The crowning achievement of a lifetime of admirable work in biblical studies, these translations and commentaries will stand as Quinn's, monument for generations to come. Jerome D. Quinn, who died in the final stages of preparation of this book, had a long and fruitful life in biblical scholarship. Since 1961, he was Professor of Old and New Testament and the Hebrew Language at Saint Paul Seminary in Minnesota, after he had received his degree from the Pontifical Biblical Institute in Rome. He was a past president of the Catholic Biblical Association and one of the editors of the Catholic Biblical Quarterly. Monsignor Quinn was active in ecumenical affairs, particularly the Lutheran-Catholic dialogue. His lifelong area of study and writing was the Pastoral Epistles of Paul, of which Titus is the capstone.